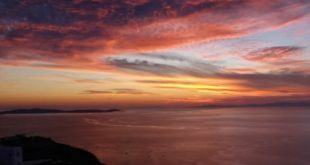 The first light of the day in Acropolis, a sunset in the Cap Sounion. But also pictures that shocked like the oil spil in Athens Riviera and the flash floods in Mandra. Greece as seen from drones. A review of 2017. Filmed and beautifully set together by the group Up Drones. According to video creator Up Drones, the video travels to abandoned drilling rigs in the Saronic Gulf next to the shores of Elefsina, but also to Lakis Gavalas’ “palace of fashion” that remains sealed on a huge plot of land in Kantza since the businessman was jailed for debts. The Tower of Piraeus, a ghost building, the second tallest tower in Greece. Although it was constructed to symbolize the maritime development in Piraeus, the imposing building was turned into a symbol of vanity and decay, giving now only images of a once glorious era. 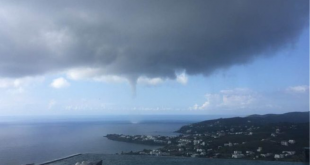 The drone flew over the mythical marble villa of the Greek gallery owner and important collector of modern art works, Alexandros Iolas, in Agia Paraskevi. The place once hosted great personalities from around the world, such as Pablo Picasso, Giorgio Armani, Aristotle Onassis and Stavros Niarchos. As soon as owner Iolas died, the building was looted, destroyed, expropriated, and subject of litigation. The drone flies over Copa Copana, a water park with huge pools and waterslides that attracted thousands of Athenians every summer. Since 2011, however, the Copa Copana has been sealed and abandoned. Abandoned are also the Olympic facilities 13 years after the 2004 Olympic Games. Apart from the deserted buildings, the Up Drones video takes us to the most beautiful dawn that took place in Athens overlooking the Acropolis and under the sound of a traditional laterna that played Manos Hadjidakis. Mano Hadjidakis we heard also by the Philharmonic of the Municipality of Peristeri in the Isthmus of Korinthos, while Ioannina musicians cheered us with traditional sounds on the lake observatories of Lake Pamvotis. The year 2017 was marked by major disasters. The flash floods in Mandra and Thriasio sank houses into mud and caused immeasurable disasters. The images from above were shocking. September 2017 was marked by the sinking of the tanker “AGIA ZONI II”, southwest of Atalanti islet in the Saronic Gulf. The oil spill spread from Salamis to Glyfada. Some people were not scared ans swam in the sea that had turned black form the oil spill. Others, overwhelmed by the ecological disaster, just watched the development via videos and pictures. The lifting of the tanker wrote the epitome in this dramatic story that will surely not be forgotten soon. The video also shows many beauties in Greece. 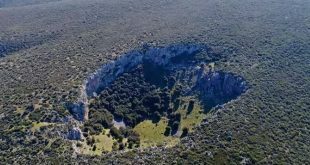 From Chaos of Lavrio, which is the “crater” of Attica and was probably created by the collapse of the large cave roof, to the twin lakes of Zerelia near Almyros that were created 10,000 years ago, when a meteorite struck the earth. 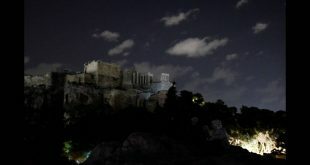 The enchanting temple of Poseidon in Sounio, the sleeping lion at Nafplio, the pyramid of Ellinikos in Argos, the Mycenaean acropolis in Kopaida, the historical trireme “Olympia”, the monument of the fallen people just outside Kalpaki and the unknown “eaglefolios” the hideout of the dictator George Papadopoulos in Parnitha, traveled to us in the past as well as in the great history of Greece. The video ends with the 2,500-kilo Vasilopita that was cut and distributed to the inhabitants of the Municipality of Peristeri. It is the biggest Vasilopita King’s Cake made in Greece so far and the best footage to conclude the 2017 review.